Approx 3" drop, on an adjustable leather cord. 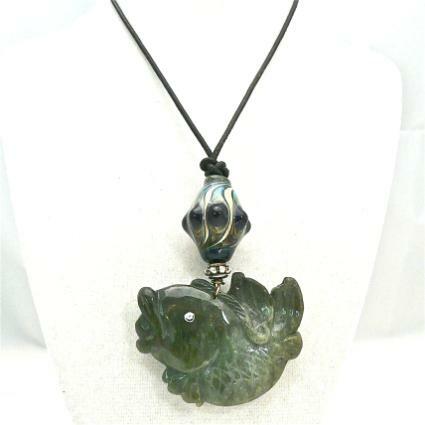 This carved green jade fish is a graceful shape. The detail is nice showing the fins, face and tail as well as the scale makings. I have topped it with a gorgeous hand blown glass bead by the renown glass artist, Tom Boylon. It is in shade of blue and the same green that is in the fish and is a swirl pattern. 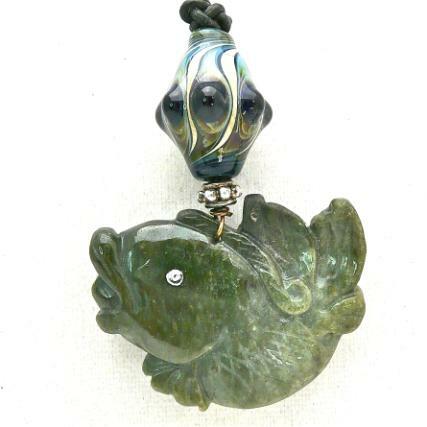 The jade fish is 2” wide by by 1 1/2”tall . 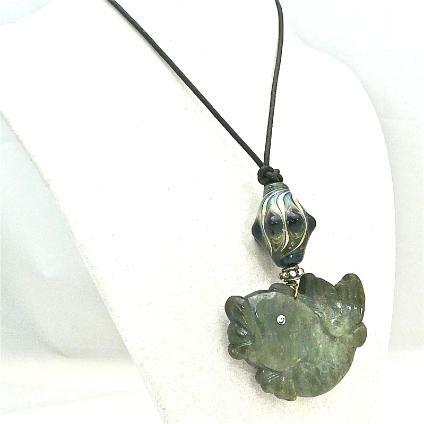 The jade and glass bead drop 3” from a black natural leather cord that is adjustable in length. The fish is a carp and is considered the most favored of all fish. It symbolizes wealth, abundance, happiness and fertility. In China the carp is symbolic of determination and perseverance. It is believed that the carp can ascend the rapids and waterfalls of the wild Yellow River will eventually become a dragon. The carp also symbolizes success in school or study.